Brett is not only a woodworker, artisitic painter, and part time mechanic, he also, in the past, has volunteered his time in the community by teaching woodworking 101 to 7th-12th graders in a home schooled woodworking program. These young adults took a 9-10 week basic course, 2 hours per week with a parent paid class fee of $75.00 per student. 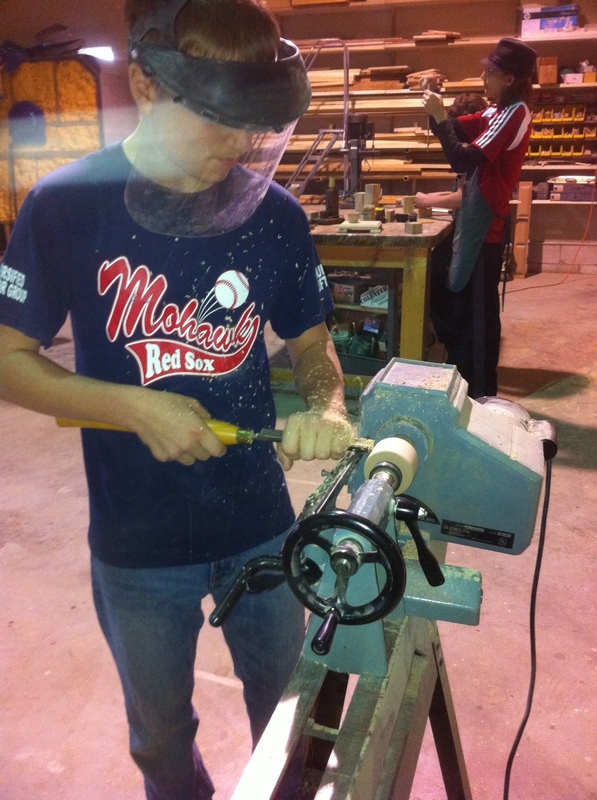 Most of the students have no woodworking experience, and start from scratch with Brett’s instruction on how to design a layout plan using a tape measure, radius gauges, and calipers. Each student will create at least 3 projects during this course, while learning hands-on woodworking skills, and procedures. This includes the use of the planer, jointer, tablesaw, bandsaw, mitersaw, drill press, and lathe. The students also learn procedures in gluing, staining, assembly, and of course, saftey in the workshop. 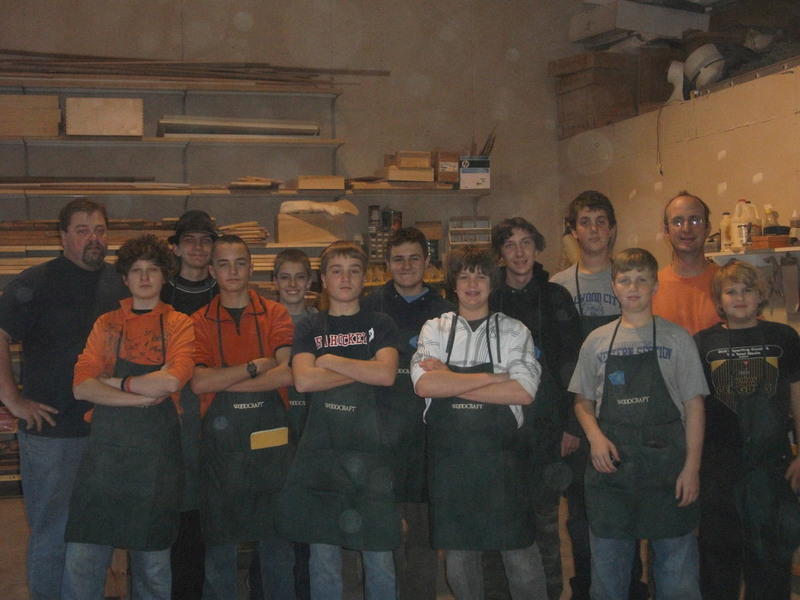 In the beginning of this program, Woodcraft donated items to help the students get started. 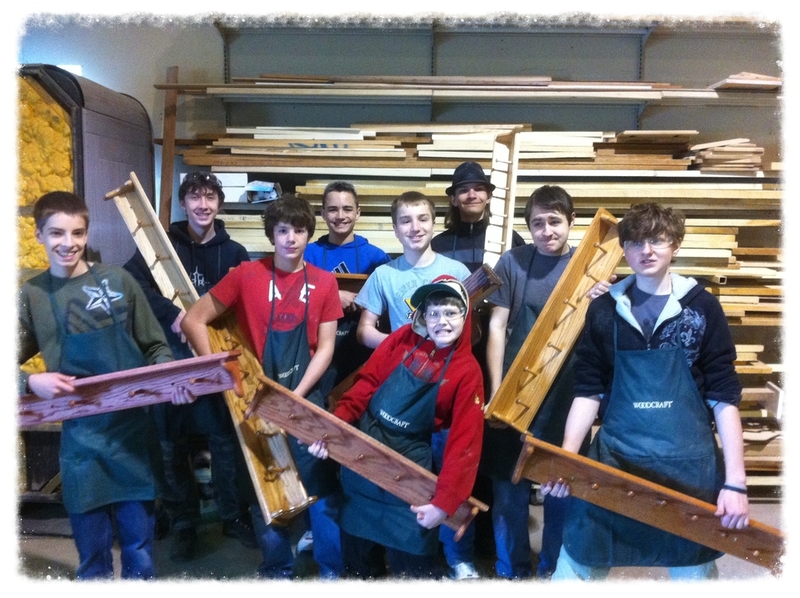 Brett’s student body, donned in their Woodcraft Shop Aprons, have put the donations to good use as they show off their first oak Shaker shelf project (above). The next project is well underway as Asher and Chad start lathe turning part of their water pump lamp projects, based on Brett’s old high school woodshop created lamp, and an updated example for the boys to follow (below). Thank You Frank Byers of Woodcraft for all of your support.